The dual-mode Mitel 5312 IP Phone is a full duplex handsfree speakerphone with multi-line, backlit display and programmable feature keys. It provides intuitive user access to more sophisticated call handling and converged applications supported by the Mitel IP communications platforms. It is easily personalized with programmable keys or a web browser-based desktop configuration tool. 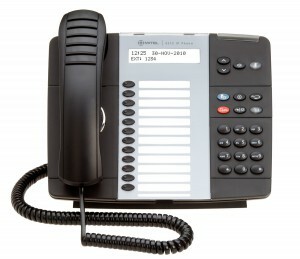 The 5312 IP Phone provides IP functionality with the ease and familiarity of a traditional business phone. User-friendly, it features easy-to-use programming tools for feature-set customization and a 40-character white, backlit graphics display. It is an ideal choice for users that need access to sophisticated system features – such as teleworkers, ACD agents, technical support staff, office workers, sales and customer service departments.